Profile: Omega Supreme is the ultimate defensive force. Although he has great strength, it is his even greater courage which truly distinguishes him. Against overwhelming odds, he will stand unwaveringly and fight with every last microchip of his mechanical being. His fellow Autobots consider him serious, even grim, but those with insight know the reason why: the enormity of the responsibility placed on Omega Supreme. He is designed specifically as the Autobots' last line of defense. It is his job to protect the Ark and anything else considered vital to the Autobot cause. He knows that should he fall in battle, chances are there will be no other Autobots left by that point to take over his role. His is a situation Omega Supreme finds both challenging and chilling. He would have it no other way. 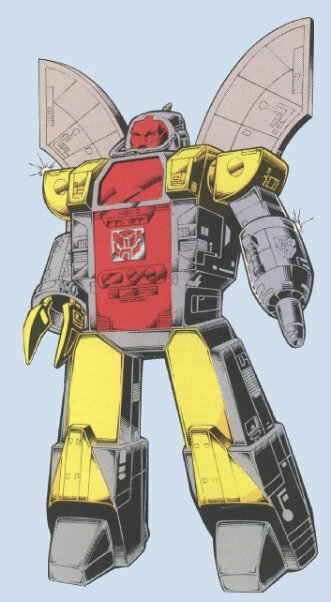 Abilities: In robot form, Omega Supreme possesses enormous strength and firepower. A blow from one of his arms can shatter a mountainside. With his clawed arm he can lift 300,000 tons. The plasma blaster on his other arm can pulverize a solid 12' × 12' × 12' steel cube. The laser cannon mounted on his head can hit an object as small as a can at a distance of 50 miles. His armored form is virtually impervious to all non-nuclear explosives and energy-beam weapons. He can change his form into two other forms simultaneously: a laser cannon tank and a rocket with launching pad. The launching pad can boost its rocket into planetary orbit. The rocket is adaptable to communication, military and transport uses. Weaknesses: In both intelligence and speed, Omega Supreme is a bit slow and plodding. He makes an easy target, but his enormous firepower can usually compensate for that.